Penny Hardy originally trained as a Scientific Illustrator enabling her to explore the intricacies and delicate detail of natural forms and structure and the fundamental discipline of observational draughtsmanship. These core skills provided a strong basis on which to explore the natural and human landscape in greater depth. Throughout her training and consequent working life alongside Architects and designers, she developed a deep interest in three dimensional forms and sculpture which has always been at the heart of all her work past and present. 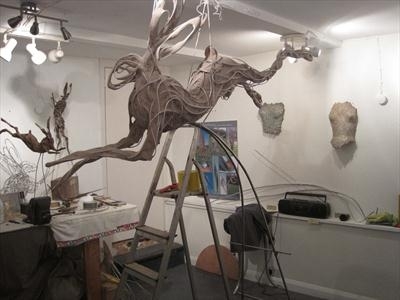 A self taught sculptor, learning new techniques and methods as each idea developed, she adapted to the demands of each new sculpture and has built a varied and dynamic portfolio. The sense of movement and dynamics within sculpture provides it with its own life and vitality. She tries to capture this in all her pieces, transforming inert materials into sculptures with a visible, tangible energy. There is a richness in discarded man-made metal items, skillfully made and creating their own mechanical energy, she brings that depth to new forms, re-using that energy for a different purpose, transforming their function to create a new entity. The liquid, fluid and flowing forms of the cast pieces dramatically reflect the movement of light across the sculptures. The dance figures, inspired by the dynamic forms of contemporary dancers use flexible, sinuous materials to re-create a visual, retained memory of movement, stimulating imagination and translating early sketches to a tactile experience. All her sculptures have a vitality and fundamental energy, with an intrinsic visual interest that she feels people can relate to and enjoy and share the emotion expressed. 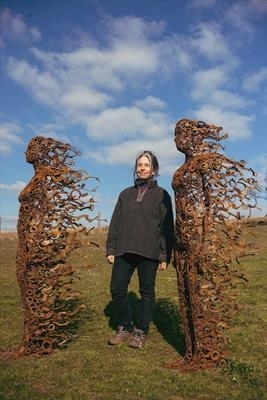 Penny has exhibited throughout the UK since her first public exhibition of dance sculptures in 2006, including Doddington Hall, Hill House Dartington and Royal West of England Academy. She works on a private commission basis and in recent years has completed commissions for clients in Italy, France, Belgium and America.